I taught elementary school for seven years before I stayed home with my kids. For 3 of those years, I was a resource teacher. I guess technically I was the "special education" teacher, but I have never been a fan of that term. One of the students I taught was Mike* (not his real name). I taught Mike his fourth grade math lessons in my room where it was quiet and highly structured. Mike needed a lot of review and I needed to find a way to repeat the concepts enough times that he could master them...without driving either one of us batty. We would start our time together with review problems. I gave him a math problem, I watched him solve it and retaught concepts. As soon as he got ten correct solutions, he could go to my treat bucket and choose a snack before we went on to that day's lesson. I made an effort to keep a large variety of interesting treats in the bucket, but for Mike, variety was not an issue. Every day he would choose a War Head (a hard candy heavily dusted with citric acid) and every day the routine was the same: unwrap, pop in, gag, gag again, blink back tears in watery eyes, get a drink, walk back into the room and pronounce "THAT was AWESOME!!" Can you see why I was thinking about those pucker-inducing candies the whole time I was making this? I can't really put my finger on the color combination that feels so tart to me (maybe the turquoise and yellow? ), but it does. All of the fabric in the mosaic squares came from my scrap bin and orphan charm square jar. 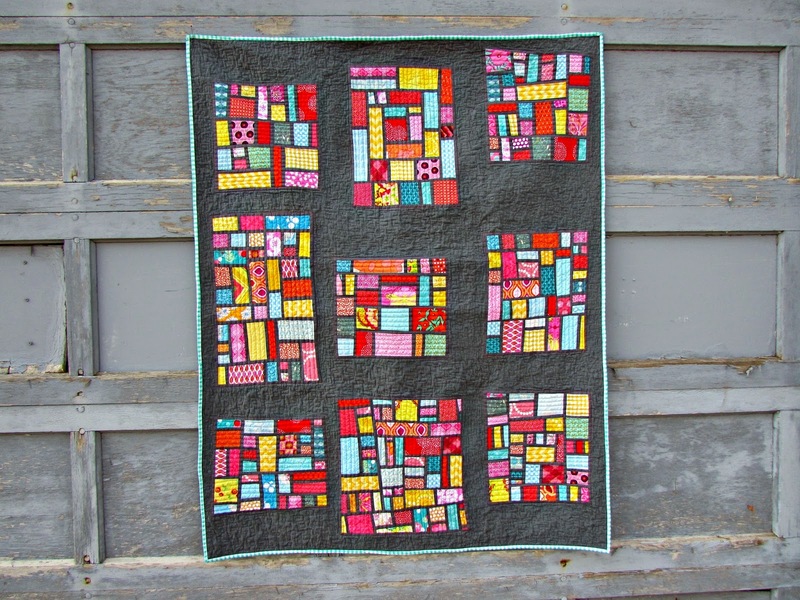 Making this was like taking a walk down the memory lane of past quilts. I used 7/8" strips of a solid gray fabric to sash around my little pieces. I kept building until I had a block that I was happy with, then I added strips of the peppered cotton to each edge. I cut each of my blocks down to 20 inches tall. 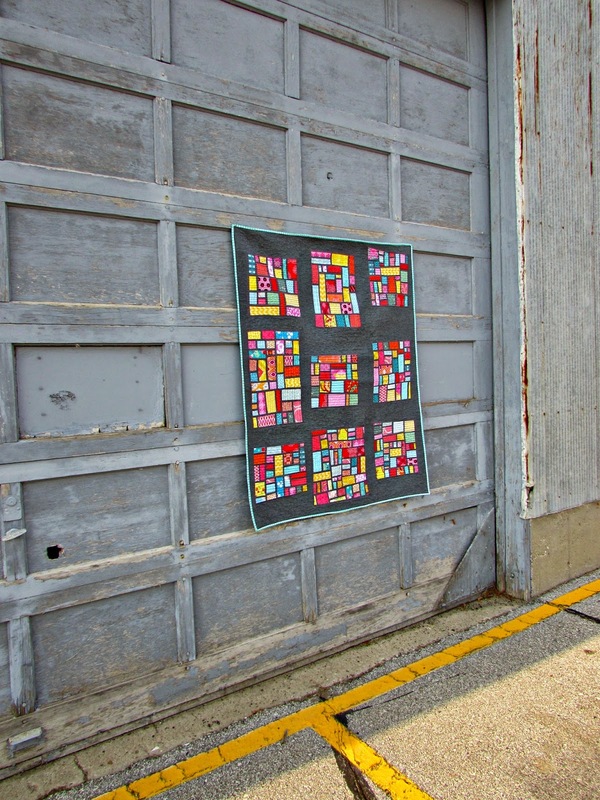 I started out cutting the blocks down to 18 inches wide, but I changed my mind after I got it up on the design wall. The proportions just seemed off. I ended up trimming the blocks to several different widths and used the calculator on my cellphone to make sure that I ended up with a rectangular quilt! To me, that is the best part of working with improv blocks...those moment to moment decisions when you can completely change your mind based on how something "feels!" I love quilting that way. Bad things (aka ugly things) happen when I over think. If you are interested in a tutorial for this method, please refer to Elizabeth Hartman's website Oh, Fransson! The background fabric is a lovely gray from Studio E's peppered cotton. I love the heathered look it has! The two different colored threads make you want to touch the fabric. I think it softens the hard edges of the mosaic design. 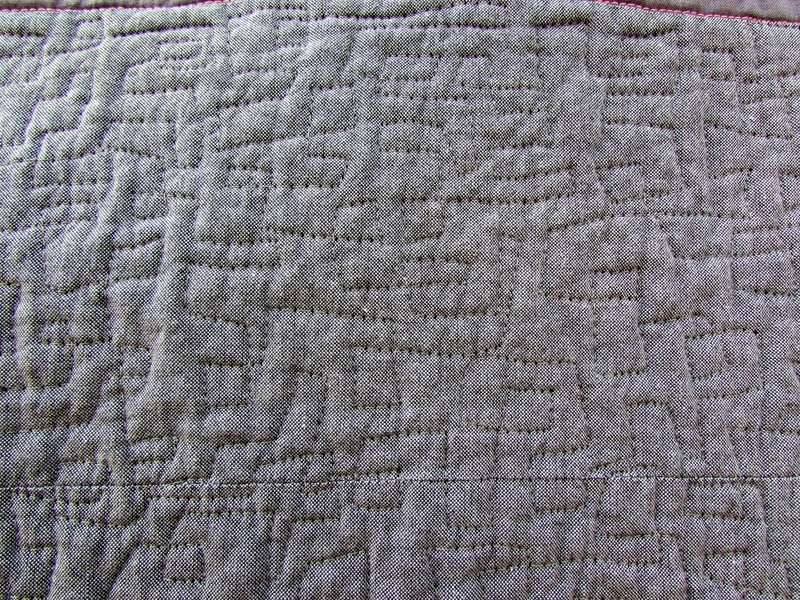 I quilted the peppered cotton in a squared off meander design using So Fine! thread. 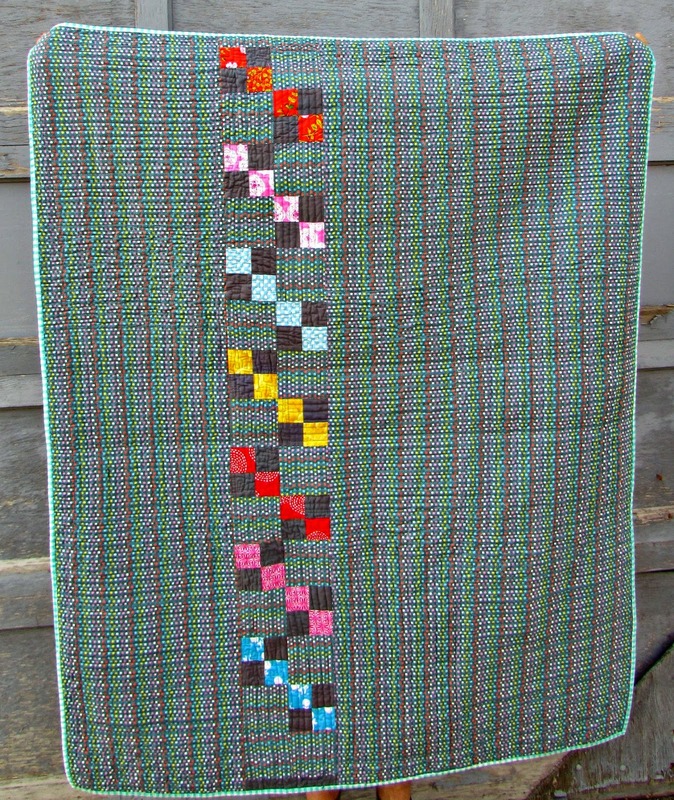 It was such a great color match that you almost have to get your nose down on the quilt to see the thread. It just appears to be fantastic texture. 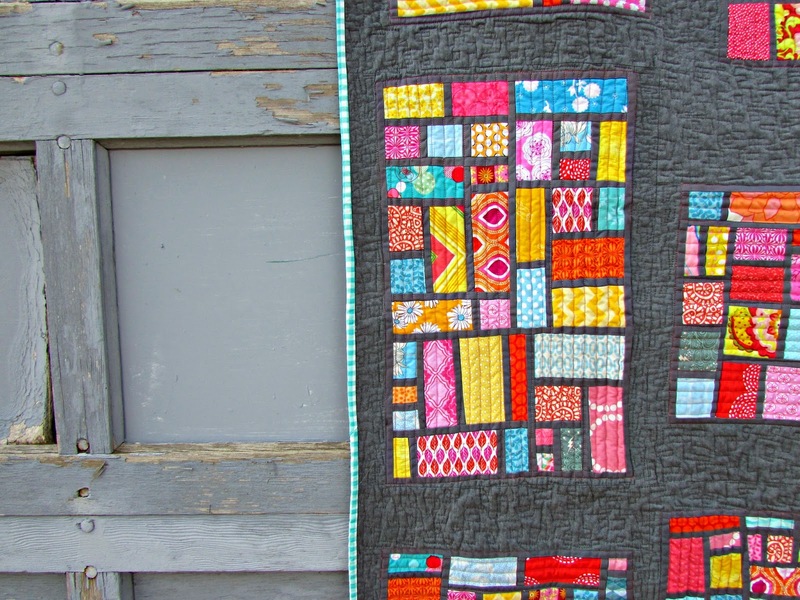 The mosaic blocks were finished with straight line quilting in a salmon colored Aurifil thread. I had this backing fabric in my stash. It coordinates perfectly with the color scheme and in a brilliant stroke of irony is from the "Sugar Pop" line by Liz Scott. There's the sweet! This is a happy quilt. I was happy when I made it and I'm happy looking at it now. Not just happy, but dare I say "AWESOME!?!" We'll just skip the watery eyes bit.